Nature & Cultures - Nature & Cultures - Professional or amateur geographers, naturalists and lovers of nature and travel, educators and students, here is your new webzine. Traditionally dedicated to geography and diplomacy, the 7th district of Paris (left), is home to the American University of Paris, the Eiffel Tower and Nature & Cultures webzine. About N&C: professional or amateur geographers, naturalists and lovers of nature and travel, educators and students, here is your webzine. "Lavapiés" , an old central neighborhood of Madrid, according to Wikipedia, with "its large immigrant population has given it an exotic, cosmopolitan flavor and it draws many visitors from other parts of Madrid, as well as foreign tourists". Katy Dycus and photographer Rubén González, a native, explore Lavapiés beyond that description and go deeper in representing the atmosphere of the neighourhood that they know so well. "Maritime piracy affects major shipping lanes, and puts at risk the lives of seafarers and merchant seamen from all over the world, of whom hundreds are taken captive each year. Millions of dollars in ransom payments are paid to pirates. It is believed that these payments are divided between the pirates, their leaders and those who finance them." (Interpol). N&C reporter and AUP alumni Alia Intably reveals the seriousness and extent of one of the gravest secand most undderestimated dangers of the post-cold war world. What is Ladin?. Yes, "LaDin", not Latin. — field notes and photos from scholar's archives (rarely published because insufficiently commercial for "professional"
— numerous resources for students. N&C will occasionally reproduce articles published in professional journals or websites, that we believe deserve a second chance at being read by readers of a popular science magazine. (See the "digest" section). We hope you join the N&C network, write to us and send us your own articles, photos and reviews. The Nature and Cultures staff. Niels Huby, founding Editor-in-Chief (for Issue No. 1); Bachelor of Arts, American University of Paris. Chanaye Thomas, current Editor-in-Chief, is an American University of Paris student with a history in journalism and photography. Also a student at the East West School of Planetary Herbology, she is a permaculture and natural building enthusiast. In the future she hopes to work with indigenous peoples and ecological conservation. Oleg Kobtzeff, founding publisher; Fellow of the Royal Geographic Society, professor of political geography at The American University of Paris. A semi-professional photographer, his work has appeared in Alaska Magazine, Science et Vie and numerous other publications; he is a regular guest on French national television (mainly France 24). Teri Worsham, copy editor, avid photographer and nature lover, is a native of Florida where she was raised on a farm. In a parallel life, she is also a massage therapist. Cyril Semenoff-Tian-Chansky, graduate of the Louvres Museum Art School, founding president,Société de Géographie Culturelle. A former officer of prestigious French museums (researcher at the Chateau de Versailles, Secretary General of the Musée de la Manufacture de Sèvres), presently a professional photographer, his work has appeared in the most prestigious publications on art and architecture in France. He is the son and grand-son of world renown natural scientists and is the great-great-grandson of Pyotr Petrovich Semenov-Tyan-Shansky, student of Humboldt and Ritter and one of the founding fathers of Russian geographic research. "The Friendly Arctic" - the title of a book by explorer and scholar Vilhjalmur Stefansson was meant to provoke the public into realizing that the Arctic regions are far from being the unlivable wastelands represented by popular belief. But once public opinion realizes how livable the Great North really is, will it remain protected from the excesses of development? "Zoos: Who Needs Them?" by Alan Aftonfalker and Yaroslav Rovenskikh. Photos by Alan Aftonfalker. Costa Rica's ban on zoos this summer coinciding with the centennial of the death of Karl Haggenbeck, one of the greatest entrepreneurs in the history of museology and zoology (and show business in the tradition of Barnum and Bailey?... ), would be an excellent occasion to raise an important question relevant to animal rights, science and education, and to the issue of the representation of nature: should zoos be banned? Or are they a necessary haven for some animals that are too threatened in the wild? is a photographic essay or an illustrated poem in prose that reveals at the same time her sensitivity towards the local populations but also her self-criticism, her refusal of all sentimentality and her harsh comments on modern humanitarian Western values as the politically correct version of old colonial and missionary paternalism. Digest section: Are there too many inhabitants on the planet? The world's population rose from 3 billion in 1959 to nearly 7 billion in the summer of 2010 and is expected to reach 9 billion by 2042. How is it possible not to fear consequences for the safety of the planet if this trend continues? With permission from the United Nations University and the authors to reprint these interesting items, N&C presents two unusually original essays on population, consumption and resource scarcity. They are unusual because, while strongly environmentalist and aware of the catastrophic consequences of overpopulation, they propose an alternative opinion to the views of Malthus made popular in our times by authors such as Paul R. Ehrlich, author of the 1968 classic The Population Bomb, or Robert Kaplan, author of the more recent but no less famous article, to become a turn of the century classic in its augmented book form, "The Coming Anarchy". We are fans, too. Are we playing at being copycats or is there something original in the online magazine you are discovering? In the early 1980's, the famous Italian publishing house Mondadori attempted to follow the example of the National Geographic by releasing its own nature magazine. Its cover literally plagiarized the style of its American model using the famous yellow margins. It may have seemed laughable at first. But once you had opened the pages of Airone (The Heron) you knew that the old Washington monthly had probably found its most challenging competitor. Are we following in the footsteps of these imitators or are we trying to create something different? EUROPEAN NATURE MAGAZINES MULTIPLIED IN THE 1980s like in Italy (far left), in the UK or France (left) or elswhere. The National Geographic Society published some itself (Via del Mondo), while others unashamedly imitated the National Geographic such as Airone, one of Italy's favorite magazines of the 1980s and 1990s; its quality features and tips on hiking all over Italy's countryside made it one of the best to compete with its famous American model. But its strongest rival is GEO, main contender for the rank of best travel magazine in the world. Although a commercial publication, GEO is considered by many as richer in content for the incisive character and even political dimension of its texts. Popular success of theses magazines was consistent with the Europeans' growing interest in eco-politics encouraged by media attention towards nature started by Cousteau and other televised conservationists in the second half of the last century. contrarily to what we would be inclined to believe because of its fame, was not the first of its kind in the United States. When, in 1888, its founding fathers gathered in the US capital’s men-only Cosmos club to sign its constitution, many other geographic societies already existed in America and elsewhere. Few other than academics know about the much older and still very active, but less media-friendly American Geographical Society founded in 1851. A third learned society founded by geographers was to appear in 1904: the Association of American Geographers. BEYOND THE BEATEN PATHS, founding director of N&C and AUP professor Oleg Kobtzeff (left) follows one of his former students into a remote gorge to explore ruins of an ancient monastery in the harsh landscape of Cappadocia, Turkey. A unique concentration of cosmopolitan experiences or backgrounds among AUP's students and faculty members allows us to share our travel iexpereinces in ways:unavailable to otehrs. We constantly discover and re-discover many regions of the globe known in-depth by one or several members of our community. N&C plans to capitalize on all of these experiences and go beyond "the beaten paths". Only a few blocks away from our offices here at N&C, at 184 Boulevard Saint Germain in Paris stand the headquarters of the oldest geographic society in the world, the Société de Géographie, the French “Society of Geography”, founded in 1821 by such historic figures of geography and science as Laplace, Monge, Cuvier, Champollion, Chateaubriand, Dumont d'Urville or the great Humboldt. A year later the Society began publishing the review which, to this day, remains its official periodical, La Géographie. After almost two centuries of publication, La Géographie recently changed its editorial line: it is no longer a strictly scholarly journal written by scholars exclusively for a readership of scholars. neither has it become a magazine of entertainment like the National Geographic or Geo, where the lines are somewhat blurred between geography and the materials found in a commercial travel magazine. It is a publication of vulgarization, i.e., exactly what we are seeking in the articles we propose at N&C. More on that later. Nine years after the founding of the Société de Géographie, the UK’s Royal Geographical Society was officially founded in London. However, it may arguably be cited as the oldest learned society in the domain of geography if one considers that part of its origins go back to the African Society founded as early as 1788, and which it absorbed in 1834 along with the Palestine Society founded also very early, in 1805. The RGS spawned, in turn, several local offspring organizations in the Commonwealth. Their experience in the publishing business was usually limited to peer-reviewed professional geographic journals. Geographic and Africa Geographic present cases where activities in favor of nature or a whole non-profit organization grow out of the periodical. IN HIS FREQUENT FIELD RESEARCH TRIPS IN RURAL RUSSIA, in the village of Balakirevo (above) Cyril Semenoff or Semenov (or Semionov) Tian-Shansky, never forgets his camera. Cyril is the youngest (with his siter Irene) of a dynasty of scientists and explorers descending from Piotr Petrovich Semionov Tian-Shansky, student of Humboldt and president of the Russian Geographic Society for decades. Originally a researcher on ceramics, Cyrille worked as a museum manager for the Musée de Sèvres and the Chateau de Versailles. An art historian, orientalist and slavist, i.e. a very eclectic scholar, he is in line with the interdisciplinary tradition of his family and is now a professional photographer. Cyril is the president of the Société de Géographie Culturelle (Cultural Geography Society) in Paris, and will be a major contributor to N&C. speaking world is Thalassa created in the 1975. Entirely focused on the sea – geography, ecology and fishing, transportation and yachting – it published a paper version of itself from the 1980's to very recently. Its website gives a good idea of how rich is the TV show and how interesting was its magazine. So if all of these magazines are so good, why bother to create Nature & Cultures? Like the great above-mentioned titles, introducing large numbers of readers to travel and physical or human geography, bring you photos and stories about the incredible natural and artificial riches on our planet, its landscapes, the people who have adapted to them over the centuries or during very recent events, the consequent development of new ways of life, and how in turn, cultures and civilizations reshape the terrain. In our pages, if you are a lover of natural history, geography, ecology, zoology, ethnography or anthropology and history, you will indeed find your favorite kind of features, reports or opinion pieces. However, in our editorial goals, we wish to go two steps beyond our beloved magazines in which we feel there is still something missing and that is politics. the world, as well as of the discipline of geography itself. N&C will be studying this reshaping of the world. interests of industry over nature. Nicolas Hulot—creator of the seminal TV show, Ushuaia, (now Ushuaia-Nature), of a magazine, and now a TV channel of the same name (Usuaia-TV) —has become a highly influential figure in the French environmentalist movement. His popularity as a media figure can easily be explained by the great efforts he invested to successfully fill the gap left by the death of Capt. Cousteau. Less friendly observers would call those efforts a communications campaign serving Hulot's political ambitions. The mainstream candidates in the French presidential election of 2007 were terribly frightened that he would run for president, so high were his actual chances of winning. What deals he made with Socialist candidate and finalist Ségolène Royal and with the winning camp of Nicolas Sarkozy (particularly through the future assistant secretary to the environment Nathalie Kosziusko-Morizet, presently a candidate to the seat of mayor of Paris) so that he would announce that he would not run for the presidency are not exactly clear. But it is probably safe to speculate that president Sarkozy's program of environmentally friendly reforms, the "Grenelle de l'Environnement" was a promise that Hulot obtained from the right-wingers in exchange for his early retirement from the presidential race. Now it becomes obvious how Nicolas Hulot's very militant publication Ushuaia was intended from the beginning to provide him with such political leverage and influencing public opinion. But the political concerns of that magazine are somewhat limited to the great agendas of the political and economic great questions of the day—sustainable development, the fight against pollution and other aggressions against nature such as habitat loss, global warming, etc., in a spirit of "what is there to be done?". This may appeal more to the green citizen in us than the outdoorsy cute pictures of cuddly polar bears in other consumer magazines. However, although Ushuaia should be praised for its militant spirit, it was not analytical and could not always be used as reading material in a course. Also, sadly, its publication has been interrupted. (The Nicolas Hulot Foundation, accessible only in French, is still active on the web). species, but to treat subjects referring systematically to geopolitics more than simply describing geographical or ecological problems"
disappearing of rare plant or animal species, but to treat subjects referring systematically to geopolitics more than simply describing geographical or ecological problems. "The Environment: A Debate" , by Robert F. Kennedy Jr. and G.W. Bush’s first EPA administrator Christine Todd Whitman recorded during their descent of Idaho's Frank Church–River of No Return Wilderness. Now that is the kind of stuff we love. Such brilliant pieces are on the level with the best articles in such publications as The Economist, Harper's or The Atlantic Monthly which published the highly controversial but nevertheless seminal “Coming Anarchy” by Robert Kaplan. The only problem with such great reviews is that they are not primarily in the business of publishing articles with a geographic dimension. While these great political periodicals have a lot of nformation to treat besides cool outdoorsy stuff, Outside does not always have room for ecopolitical features on its pages where editors fight for space to squeeze in the latest news about Bodie Miller, Lance Armstrong, diet and exercising fads, or book reviews about an author unraveling the mystery of some stranded mountaineers resorting to cannibalism or amputating one's own arm to escape being trapped in a rock formation. Don’t get us wrong. Some of us are avid readers of Outside, but our idea here at Nature & Cultures is to have a magazine devoted to analytical articles on the politics of geography, wildlife management, agriculture, development, ethnography or other subjects related to human geography and the environment. We have become too impatient to wait for these items in our favorite publications. So who are we and why "Nature & Cultures"? Our second step is towards the creation of a publication which, while remaining as entertaining for a large public, will serve an academic purpose. Our webzine is to be more than simply "educational." It is what the French geographic society attempted with its new version of La Géographie, as mentioned earlier. Unfortunately, it is in French. The idea of N&C was born when a great fan of La Géographie, The American University of Paris Professor of Political Geography and Fellow of the Royal Geographic Society, Oleg Kobtzeff, felt the need for an English language equivalent for his English-speaking students. N&C will be closer to a scholarly journal than most English language travel and nature magazines. Don't be scared: "closer to a scholarly journal" does not mean an extremely strict academic style with more footnotes than text. N&C is published above all for your pleasure. But one does not necessarily contradict the other: Yale’s Journal of the School of Forestry & Environmental Studies, Environment:Yale, and University of Montana’s Camas: The Nature of the West are excellent examples of the kind of online magazine we wish to publish ourselves. Nor must we forget Explorations, the scientific magazine of the Scripps Oceanographic Institute. Now, if you were someone from Environment: Yale or Camas, wouldn’t you feel a bit… surprised (to stay polite) that a group of academics from another institution would copycat their prestigious and more experienced enterprises? Here is what the new kid on the block would answer: The American University of Paris has been offering for decades a unique educational environment. Although not seen as a competitor equal to the Ivy League schools or Oxbridge, AUP has been recognized internationally for something that makes it unique. It is not only the richness of its experience in diversity but the length for which that experience has lasted. It gives AUP's faculty and students a special perspective on world affairs and human geography in the era of triumphant globalization. And it is an experience worth sharing. FORMER PRESIDENT OF FRANCE VALERY GISCARD D'ESTAING AND AUP STUDENT AMANUEL NEGUEDE debating the advantages of new communication technologies after a master class organized by the AUP Politics Association (AUPPA). A historic figure of European unification, "VGE" offered surprisingly critical retrospective views on the rise of the European Union of which he had been a major actor. "We do not strive towards diversity in education... We pioneered it!" The University was created in 1962. Between 800 and 1010 students attend AUP every year. Over 100 nationalities are represented in that relatively small student body. Do the math. It gets even more complex as you look at the details: a typical AUP student often speaks two to three more languages in addition to English, and is the child and/or grandchild of people who may carry passports of an amazing array of different nationalities. Most AUP students have also added to their already extraordinarily cosmopolitan heritage by having lived in countries where they were influenced by yet more foreign cultural experiences. And all of them study right in the center of Paris, within walking distance of the Ministry of Foreign Affairs, most diplomatic missions, UNESCO and several other major international institutions (more than a few are actually employed there). In many classrooms, you will find a child or close relative of a world leader, of a head of state, of a senior diplomat, of a recognized scholar (including faculty members of top 10 world universities), of a major journalist, of an artist or other kinds of “movers and shakers” of global affairs. In this community, many, very many students share a passionate interest for environmental affairs and everything geographic with teachers of all disciplines. One of the most active of our faculty members who was even rewarded by none other than Jane Goodall for being such a mover and shaker in making our university a “green” university teaches… litterature! (Note the subtle name-dropping of Jane Goodall, now a familiar figure on our campus). Even administrative staff members are enthused about how the university is moving towards what an article in Time once presented as an environmentally vanguard "campus of the future", a result of the influence of The American University of Paris board member, the recently departed and deeply regretted Edward A. Frieman, a highly distinguished oceanographer, diving companion of Captain Cousteau and former director of the Scripps Oceanographic Institute, and changes implemented by recently The AUP president Celeste Schenk. THE FAMOUS PRIMATOLOGIST JANE GOODALL (left), after another of her frequent visits to the American University of Paris offers a gift (a poster of a gorilla) to an unsuspecting Linda Marz (left) a professor whose contributions to the AUP's awareness of environmental affairs, such as creating a local chapter of Roots & Shoots, has been exceptional. N&C will be working closely with Linda and her band of merry and hard-working activists. Moreover, with our background, with this assortment of experiences and the worldview we gained from them, we believe that we can share a little extra something that you may not find in other magazines on nature and human geography. In N&C you will read about the epistemology of geography and ecology—in other words, about the way in which these or other related disciplines developed as an independent science. For example, in this first issue, you find and hopefully enjoy our short article presenting the problem of representation in geography which will introduce you to such thinkers as Gaston Bachelard, the postmodernists or to the great theorist of geographic thought, Yves Lacoste. The related article on zoos and menageries by Yaroslav Rovenskih is not only about animal rights but is related to this question of representation—how we view nature, how our words, images and spectacles convey those views, and how this reveals something about our entire view of the world, our philosophies and our politics. If you already know about such subjects, it means that you could be a teacher or a college or university professor. The pages inside Nature and Cultures are just for you (or your students), if you're seeking something more than what is found in regular consumer magazines. A BLADESMITH IN MYANMAR (Burma) working in a traditional knife-making workshop in the state of Shan, in the Northeastern part of the country. He was photographed by Niels Huby, N&C editor-in-chief for issue 1. Niels also provided illustrations for our cover and for this issue's article on piracy. Such encounters in places almost impossible to reach, even for highly privileged travelers like diplomats or journalists, is the kind of opportunity made possible by the chemistry of more than one thousand students and professors from more than one hundred countries sharing personal experiences, plus travel advice and support, in a small community like The American University of Paris. our experiences in the field. Here at AUP and at Nature & Cultures, we can think of at least a dozen colleagues who would need two or three extra courses per semester for several years just to show all the slides that they have brought back from their field research trips. Unfortunately, there is always some mid-term, final or other deadline strictly set by the syllabus that always seems more urgent than the great stories we would really like to tell. Getting ready for action on France 24 (left), Australian anchorwoman Annette Young is photographed by her own interviewee, an America University of Paris porfessor and N&C staff member. The 24/7 news company broadcasts in French, English, and Arabic from the banks of the Seine river in the dynamic suburban city of Issy-les-Moulineaux, a genuine technopolis just outside Paris city limits. France 24 makes very frequent use on all three channels of the exceptionally diverse human resources of The American University of Paris, where students and alumni work as interns or employees, and where professors are invited as commentators several times a week. use below the graduate level) or the contrary, almost childish in their prudent use of very conventional wisdom. When they are not forced to include great issues that are so frequently heard about in the news (global warming, habitat loss, pollution), authors of textbooks trying to reach the largest possible public and not create waves are forced to be so consensual that they can become boring. Instructors trying to bring to their young adult students something else than a glorified junior high school primer on geography—in other words, writing that could be at the same time exciting, intellectually challenging, easy to read and helpful to study for exams all at the same time— are forced to require them to buy a great amount of expensive books in which they would find the 10 percent of useful material, or spend long hours in front of the photocopying machine violating copyright law. kind of needs we will try to service. PARIS, OUR HOME TOWN (above) - a hub of international relations and news. Above: a view from the photo-journalists' tribune: the new president of one of the G7 countries, France, celebrates inauguration ceremonies at Paris City Hall, Spring 2012.
there. That love and our taste for adventure and discovery is what most of all inspired creating this publication. Enjoy. PARIS, OUR HOME TOWN (left) - a hub of international relations and news. 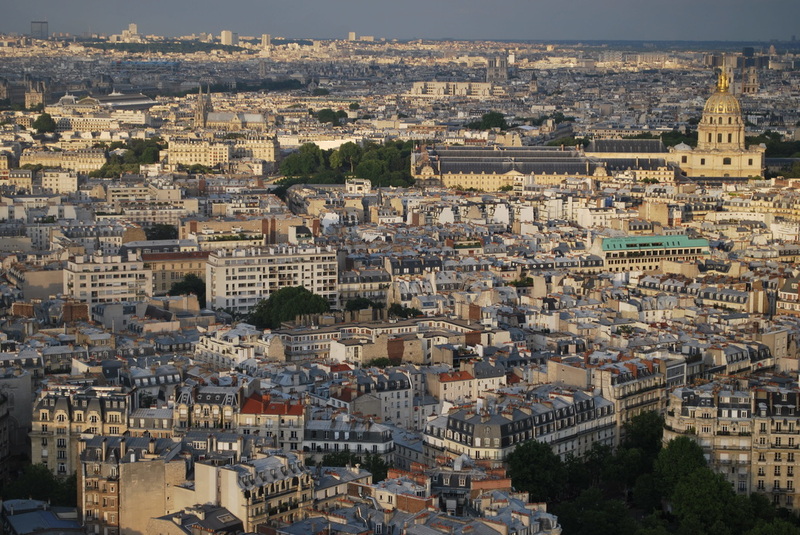 Above: a view from the Eiffel Tower over Paris' 7th district - an area crowded with embassies and international organizations (the most important one is UNESCO) and home to The American University of Paris and N&C. About the 7th district read "The Cosmopolitan District" by Marko Milic in this issue of N&C.